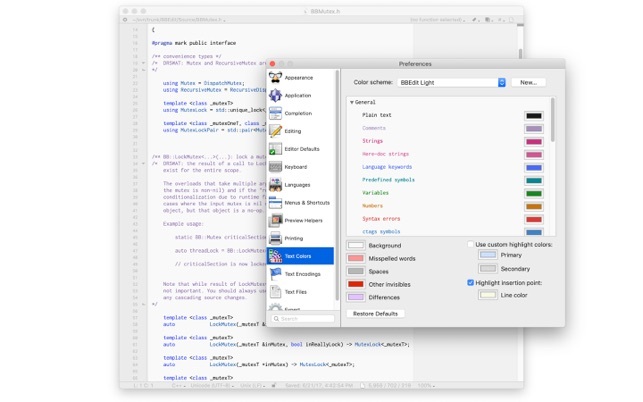 BBEdit is the leading professional text, code, and markup editor for the Macintosh. As the "go to" tool for web site designers, web application developers, writers, and software developers, this award-winning product provides an abundance of high-performance features for editing, searching, and manipulation of text, code, and HTML/XML markup. 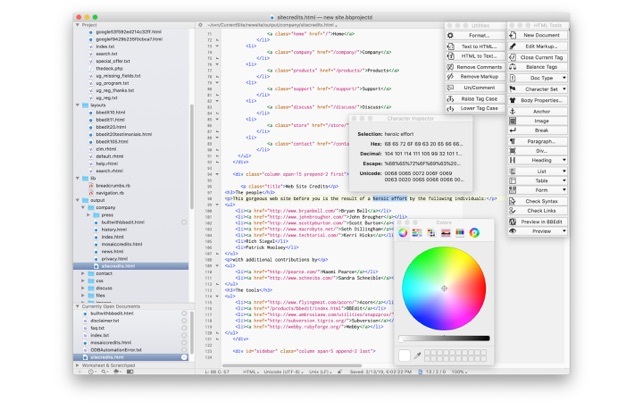 An intelligent interface provides easy access to BBEdit’s best-of-class features, including: grep pattern matching; search and replace across multiple files; project definition tools; function navigation and syntax coloring for numerous source code languages; code folding; FTP and SFTP open and save; AppleScript and Automator support; Unix scripting support; text and code completion; a complete set of robust HTML tools; and more. 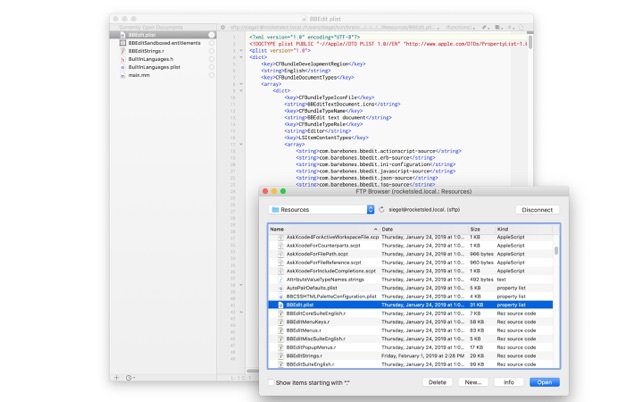 BBEdit offers a 30-day evaluation period (beginning the first time you use it on your computer), during which its full feature set is available. 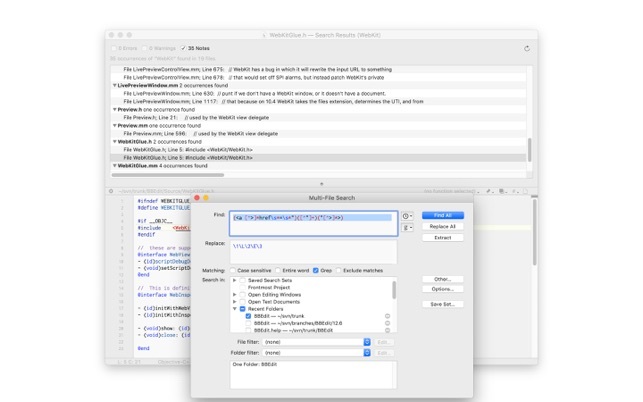 During the evaluation period, BBEdit is fully functional. After the evaluation period has expired, you can continue to use BBEdit for free, forever, with no nag screens or unsolicited interruptions. 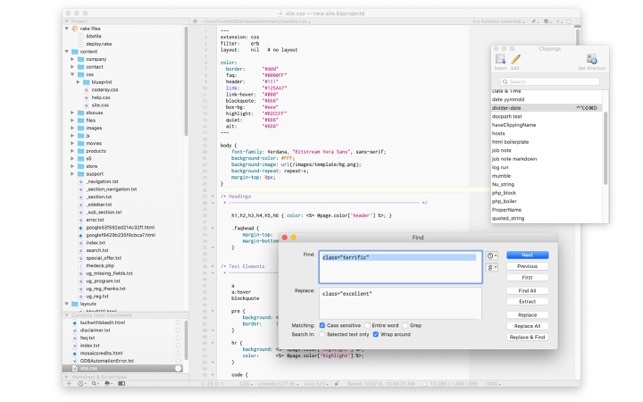 In “free mode”, BBEdit provides a modified set of features, which incorporates a powerful set of core features. 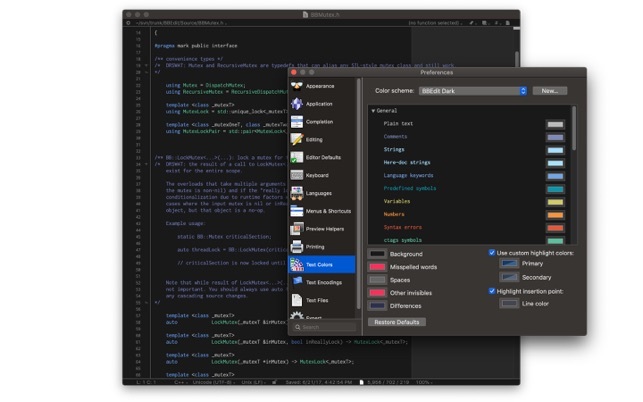 Using BBEdit in free mode costs you nothing, while providing an upgrade path to advanced features and capabilities. To enable BBEdit’s advanced features after the evaluation period is over, you will need to have an active BBEdit subscription. Subscriptions are available on either a monthly or annual basis. An active subscription gives you access to all of BBEdit’s advanced features, including any new features that we introduce during updates or major upgrades, for as long as the subscription is in good standing. Please see our comparison chart for a detailed listing of which advanced features are available with a subscription. We do not collect any data from your use of BBEdit, whether or not a subscription is in effect. Your use of BBEdit is governed by the terms of its end-user license. When you purchase a subscription, payment will be charged to your iTunes Account upon confirmation of purchase. Your subscription will renew automatically, unless you cancel your subscription at least 24 hours prior to the end of the currently active subscription period. Your iTunes Account will be charged for the renewal within 24 hours prior to the end of the currently active subscription period, and your account history will reflect the cost of the renewal. You can manage your subscription and cancel automatic renewal by going to your "Manage my Subscriptions" page after purchase. Purchasing a subscription will permanently end your evaluation period, and forfeits any unused portion of the evaluation period, if applicable. A subscription for a text edior? What is going on these days? Even as a one-time purchase it seemed overpriced to me, but this is just out there. Past free versions of BBEdit didn't nag after the trial expiration, so assuming the same is true with this one I might still be able to recommend it as a free editor with limited uses. 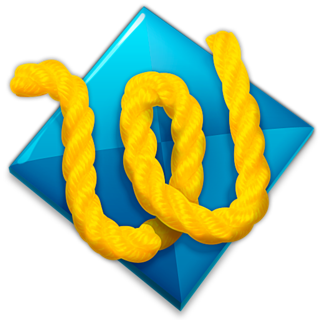 (I mostly use it (and previously TextWrangler) to open a file to preview or paste somewhere else, and other free editors like Atom or Eclipse to manage projects). But a subscription scheme for a text editor with a few advanced features really should not be tolerated. 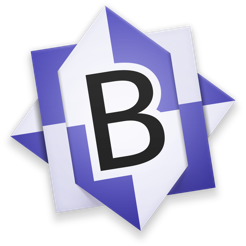 BBEdit was incredible back in the days when WebSTAR and Dreamweaver were still a thing and for many, many years I could not imagine living without it. These days, it's a far cry from adequacy as a web development tool. From its anemic syntax highlighting options to its flat out lack of support for any language newer than Markdown, this application is a dinosaur that appeals primarily to nostalgic sorts who don't actually build websites for a living. I mean, if you look at BareBones' site for BBEdit right now you'll find most of the links 404, even the one that says it'll tell you "What's new in 12." They're probably the only people in the world still cowboy coding right on an SFTP server anymore and it shows. The sole reason I continue to keep it on my hard drive is the "Zap Gremlins" feature. It's wonderful and no modern editor has anything quite as simple or effective. Thank goodness I can have that for free. BBEdit is my absolute favorite text editor. I use it for taking notes, managing bash scripts that I'm working on, writing fiction, todo lists, writing quick items for the Star Wars Galaxy of Heroes guild I'm in, writing documentation for work, editing mobileconfig files, and a host of other things. It's rock solid, fast, easy to use and has tons of great features to manage the text I'm writing and manipulating. I'm really excited that Apple and BareBones were able to work together to get BBEdit back in the Mac App Store. If you're looking for a multi-tool for text, this one is best-in-class. 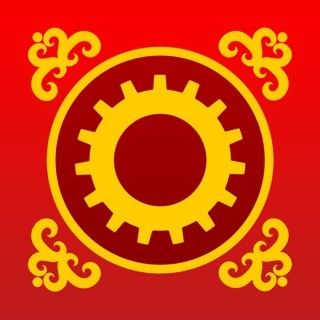 © 1992-2019, Bare Bones Software, Inc.